This isn’t so much a detailed review, you just need to Google for tons of reviews & info on how it rides & handles. This is more about how it stands up to long term use. This one’s an ’08 model – not so much has changed for 2010; a slightly lighter/stronger top tube by Reynolds & the head angle is a little bit slacker. I wouldn’t have said it needed it, but it’ll make the bike slightly more stable at speed & help prevent over the bars incidents on the really steep bits. …back to the bike – it’s lived up to expectations. No major problem’s so far since it was bought in Dec 2007. It was the basic ‘S’ model with factory upgrades where it seemed worth it. Forks were upgraded to Fox TALAS RLC, hubs, brakes & headset to Hope items & a GravityDropper seatpost added by me. Reasoning was that drivetrain stuff will wear out anyway, so why pay extra at the start? Just upgrade if necessary when stuff wears out. The forks went to MOJO after a year to have the TALAS system sorted, it almost stopped working due to an unsealed system on the ’08 forks that lets in dirt. They fitted the ’09 assembly which has been great – instant travel adjust instead of almost instant, and it’s now sealed. It’s currently the only system that’s so easy to use you can adjust it on the move. Pivot bearings are still smooth, so well done Orange for quality bearings & a design that obviously doesn’t put much stress on them. Had to change the shock bushings & went for TF Tuned stainless ones which have been good so far, and they sell the tool for DIY purposes. Although it’s nothing to do with Orange as such, the Fox shock has done well. No issues & it’s easy to change seals on the air can & add some float fuid every so often just to be on the safe side. Mojo reckon if you do this you won’t need a factory service as soon. Most upgrades have been due to wear & tear or personal choice rather than breakages. One exception was a front rim – bent the original WTB item on not too heavy a landing. Replaced it with my current rim of choice, a Mavic EN321 (used to be XM321); cheap, reasonably light & I’ve not bent one yet. I replaced the rear recently with one that became spare from another bike. It’s handy that EN321’s & WTB SpeedDisc AM rims take the same length spokes, so can be swapped without replacing the spokes if they’re in good order. The other major replacement was a set of Middleburn RS7 cranks, due to the Truvativs being required for another bike. Nothing wrong with the Truvativ set, the external bearings don’t last ages, but I got a lot longer from them than from Shimanos I’ve used. The RS7’s are an awesome bit of kit & there’ll be a detailled review sometime. That’s it really, does everything I need & does it well. 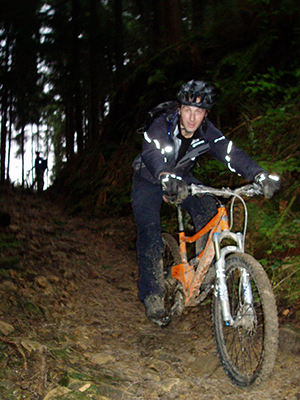 This entry was posted in #26aintdead, Mountain Bike Reviews, MTBs, UK designed, UK manufactured and tagged #26aintdead, All Mountain, classic mountain bikes, long term review, Orange Five, Orange Mountain Bikes, Trail Bike, XC on December 11, 2009 by steve.